Your design must be new, project must incorporate elements from provided sketch, and you mustl ink to Mr. Linky on the Peachy Keen Challenge Blog before March 7th. As with all of our sketch challenges, the basic layout should be there, but feel free to flip elements & get creative! For my card I used PK-283 Cheers For Green Beer stamp set from Peachy Keen Stamps. I stamped this adorable mouse with Memento Tuxedo Black in, and colored it with my Copic markers. I used my Fancy Tags Nestabilities die for one of the elements in the sketch, and kept the embellishments to just the rhinestones and satin ribbon. The patterned paper is from Best Creation, Inc.. Their Bella collection, I believe, and the card stock is a beautiful shimmery green from Bazzil. I did do a little bit of air brushing on the fancy tag before I popped it out of the die, which is a really nice effect. I hope you'll find time to play along with our challenge, because there's a wonderful prize up for give away to one lucky player. You can find all the sketch details, a picture of the prize, and samples of some amazing artwork using the sketch, compliments of our talented designers on the Peachy Keen Challenge Blog. We have a very special guest designer this week, too! Cindy Burgess from Mrs. B's Craft Room is designing with us for this challenge, and all week long on the Peachy Keen Stamps Blog. 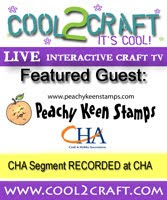 Be sure to drop by to see all the amazing creations Cindy comes up with using Peachy Keen Stamps, and don't forget to visit her inspiring blog and leave her some love, when you do!!! Thanks so much for stopping by for a visit today! It's always my pleasure to have you, and I wish you a glorious day filled with happy stamping! Cute, cute, cute! Love that image. So perfect! As usual your coloring is amazing! I love the sparkle in the background paper. Your air brushed tag and bling finish the card beautifully! You rock! This image is sooo adorable! Once again, you have outdone yourself Lorie! Amazing!! Lorie, that image makes me smile! It's just too darling! And the colors... wow! Gorgeous card!!! This is so beautiful! You have such an elegance to your cards. You work always look so clean and well put together. You coloring is amazing and you always do such a wonderful job! Oh my....this is a cute card. SO much FUN...love, love love it...wow Lorie each and every card you do is a work of art, each one equally suitable for framing...jaw dropping perfection!!! WOW I love your card,great job on the sketch!SUPER CUTE! !love the colors!!!! I love it when a card makes me laugh out loud and this one sure did. Amazing colors and layout Lorie ~ it's just perfect.